Obama Seeks $1 Billion To Boost U.S. Military Presence In Europe : The Two-Way His comments in Europe come amid simmering tensions with Russia over its actions in Ukraine. 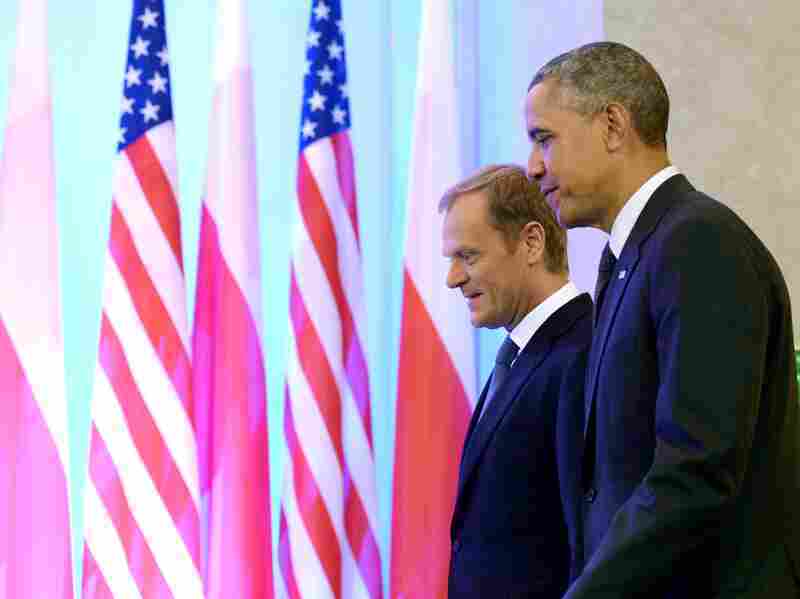 President Obama and Polish Prime Minister Donald Tusk at a meeting in Warsaw, Poland, on Tuesday. "Today I'm announcing a new initiative to bolster the security of our NATO allies here in Europe," he said in Warsaw, Poland, at the start of a four-day trip to Europe. "Under this effort, and with the support of Congress, the United States will pre-position more equipment in Europe. We will be expanding our exercises and training with allies to increase the readiness of our forces." Obama called on Congress to approve up to $1 billion in support for the effort. "If approved, the funding will be used to increase military exercises and training missions on the continent, as well as rotations of air and ground forces, the White House said. Officials said Obama was also seeking to ramp up U.S. Navy participation in NATO deployments in the Black and Baltic seas, plus working to boost the military capacity of non-NATO countries that sit on Russia's border, including Ukraine, Georgia and Moldova." The West's relations with Russia are expected to dominate the president's trip to Europe. Earlier this year, Russia seized Ukraine's Crimea region, and in the eastern part of Ukraine, pro-Russia rebels and Ukrainian forces are engaged in bloody battles. As NPR's Scott Horsley reported for our Newscast unit, Obama will meet with Ukraine's newly elected President Petro Poroshenko, as well as leaders from Eastern Europe, "offering reassurance about U.S. commitment to security in the region." Both Obama and Putin are expected to attend the 70th anniversary of D-Day in France on Friday. No meetings are planned between the two men, but as the AP notes, "White House officials haven't ruled out that they could cross paths." Hours after the U.S. pledged to commit $1 billion to strengthen Europe's defenses in light of Russian action in the Crimea and eastern Ukraine, NATO Secretary General Anders Fogh Rasmussen said the bloc was developing a "readiness action plan" involved more joint exercises and bolstering NATO's cyber defense policy, the BBC reports.